There is no hiding Liam’s “Old Country Soul” within his youthful body. Growing up with influences like Vince Gill, Albert Lee, Joe Walsh, Glenn Frey, David Gilmore, he was destined to follow one path on his musical journey. Throw modern idols like Brad Paisley and Keith Urban into the mix and you have the recipe for a credible and authentic Country sound. Liam combines the best elements of a traditional country sound with the contemporary country rock sound that had made the genre one of the most successful in North America. Unlike many of his peers who specialize in a couple of instruments, Kennedy-Clark challenges himself to multi-skill as a musician. He is currently proficient with Acoustic & Electric Guitar, Upright & Electric Bass, Piano & Organ, Drums, Harmonica, Trumpet, Mandolin, Banjo, Dobro and Piano Accordion. Along with regular gigs across Australia and New Zealand over the past few years, Liam spends a lot of his spare time in his home studio, where he has been undertaking session work on a variety of instruments, as well as travelling around as a live session musician for other artists, including Adam Harvey, Lee Kernaghan, James Blundell, Seleen McAlister and many more. 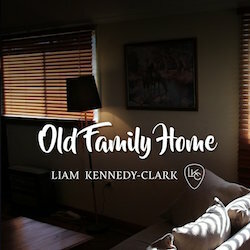 On a run of shows last year, Kennedy-Clark set himself a challenge to write a song a day and Old Family Home was the first one to be written. It’s about an old Queenslander house on the banks of the Thompson River, which used to be home to a young family until they outgrew the home.